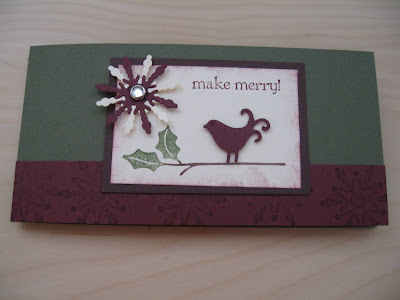 I received my new Stampin'Up Sizzlets Merry Details today and thought I would try it. It easily cut out the bird and snowflake images and only cost $7.50. I love it when I don't have to cut things out. Of course you need the Big Shot die cut machine to go with it. Christmas is coming. Put it on your wish list! I used Always Artichoke card stock as a card base(6"x12") and layered on Bravo Burgundy card stock that was stamped with the snowflake image from Berry Christmas with Bravo Burgundy ink. I colored the branch with a Chocolate Chip and Always Artichoke Stampin' Write marker and stamped on Whisper White card stock. The bird and snowflake images were made with the Stampin'Up Sizzlets Merry Details die and Big Shot die cut machine. I added a clear Rhinestone brad to the center of the snowflake.